Paid link - if you want to purchase the app for 0.99 then you'll help encourage me to add more features :) Also includes a free never-ending "Trial mode"
1.5 - comments included - page orientation fixed to portrait - autoload added to lists - when you scroll to the bottom of the page then the next page loads. 1.6 - bugfix for more than 10 answers - sorry! 1.10 - some minor adjustments to navigation - especially as 1.9 had a back button problem - sorry - still more to do here! A mix of 1.9/1.10 for Overflow 7 and Overflow 7 Free are now on the marketplace today (March 9th). 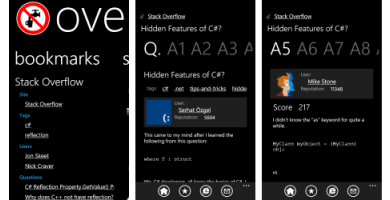 Browse other questions tagged app silverlight windows-phone-7 .